This website is a static archive of the original. Interactive features no longer function and some links may be broken. The Proceedings of the 5th European Conference on Thermoelectrics, ICT2007. Full text of all papers presented at the conference are available here. 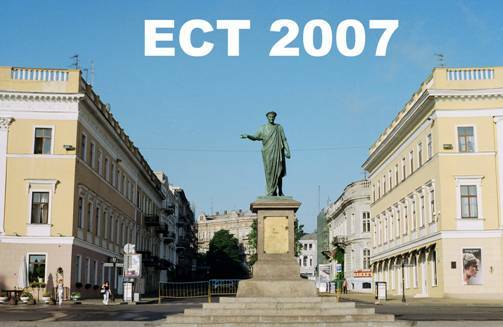 ECT2007 is the 5th European Conference on Thermoelectrics. The Conference took place in Odessa House of Scientists on Monday September 10 through Wednesday September 12, 2007. The conference highlights fundamentals of thermoelectricity, development of new thermoelectric materials, devices processing and their forefront applications in cooling and electricity generation ranging from macro to nano scale. This year an emphasis will also be on the industrial, manufacturing and marketing aspects of thermoelectricity. All scientists and engineers working in the field of thermoelectricity were invited to attend ECT2007. Submitted by ztadmin on Mon, 2007-10-22 16:51.